Basic Living - Blog: What's for dinner tonight? Isn't trying to decide what's for dinner one of the hardest things sometimes? It seems like I repeat the same recipes every two weeks. In an attempt to get inspiration on what to make for dinner, I used to spend hours watching the cooking channel. Over time, I began to enjoy cooking for my wife and to take chances with new things. Well, today was one of those days where I had to improvise and adapt to the world around me. I usually make this dish with cream of mushroom soup, but when I was half way done the reality struck me like a bolt of lightening "we're out of cream of mushroom!" Here is the accidental recipe which turned out to be a home-run! Make bite size meat balls with ground beef and place them in a 9x13 casserole dish. Sprinkle garlic salt and black pepper on them to season the meet. Then cover the meet with chopped potatoes, onions, carrots, and bell peppers. Sprinkle seasoning on the vegetables as well, then followed by the alfredo sauce. Generously sprinkle grated cheese on top and cover with tin foil. Bake in oven at 375 degrees for about 75 to 90 minutes or until potatoes and carrots are tender. A little yummy trick here is to take the foil off at about 15 to 20 minutes before you take it out of the oven. It will brown the cheese and will add a nice flavor to the dish. It makes a very hearty and comforting dish and it will also warm up the house because you use the oven (we know this because our house in Japan is so stinking cold!). Sometimes, it stinks to not have the right ingredients, but other times, it could lead to nice discoveries that will pay great dividends. My wife was certainly impressed with how good dinner turned out. What's for dinner at your home tonight? Leave a comment and share your discoveries and recipes. 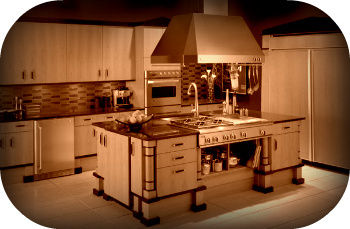 be sure to stop by at Basic Living for your kitchen needs, too!